This caddy for cleaning wipes keeps board wipes readily on hand so you can improve the erasability of your whiteboard. Cleaning it regularly keeps the surface looking like new. Unlike spray cleaner, ready-to-use cleaning wipes are pre-treated with a safe, nontoxic cleaning solution and eliminate the need to track down paper towels or cloths. These moistened, disposable cloths quickly remove ink and marker dust from your whiteboard surface. 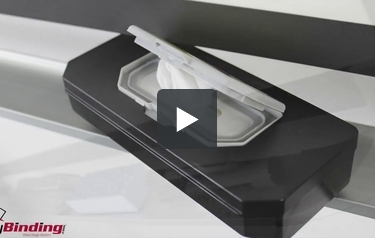 The dispenser provides a convenient solution that keeps wipes moist over time. The container is airtight once the reclosable lid is snapped closed. Caddy is made of durable, black plastic and comes pre-filled with 30 wipes. Caddy is specifically designed to fit perfectly on the full-length accessory tray of Quartet Prestige 2 whiteboards (sold separately). Pair with other Connects accessories to get the most from your whiteboard. Welcome to MyBinding video. Quartet has made a whole line of Connects accessories, the Prestige 2 whiteboards. All kinds of ways to save you space and keep you organized; among them is the Cleaning Wipes Caddy for the cleaning wipes refill. A place for everything and everything in its place, that's professional. A caddy for your cleaning wipes is not only convenient but also looks great. Those trays can get mighty cluttered pretty fast. You might even considering storing the entire thing inside an accessory storage cup on the side of your Prestige 2 board. Part of the Connects line for Prestige 2 whiteboards. For more demos, reviews and how to's, check out MyBinding.com.